Home » Unlabelled » Review of Scott Garson's IS THAT YOU, JOHN WAYNE? 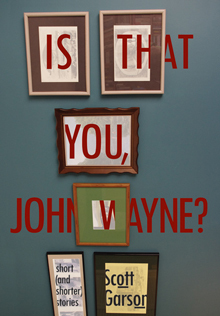 Review of Scott Garson's IS THAT YOU, JOHN WAYNE? Is That You, John Wayne? by Scott Garson is subtitled “short (and shorter) stories,” and the collection is mostly comprised of the shorter. While these flash pieces have everything you’d expect from the editor of wigleaf, Garson also shows us his ability to sustain a piece with stories in the 30-40 page range. Garson’s expertise in concision, his practice at containing whole worlds within 500 words, make the longer stories feel more like novels. Garson is somehow exhaustive within (and without) the space. Part of this may come from his attention to detail. Garson’s objects tell us all we need to know about character or mood. In “Sofa,” a gifted couch stands in for the complications of a mother dating post-divorce. In “Greatman and the Non-Human Girl,” a superhero who has lost his power begins collecting junk, “His personal favorite: the ones like the figurine, requiring intervention.” These objects don’t work as extended metaphors, which would make the stories feel overworked. Instead, they are essential parts of the story, part of the plot. They are the real objects we place too much importance on in our own relationships. Other details are simply those we love to read, the ones the make us stop and read again. In “Kiss of the Underachiever,” “Weakish silver area light exposed a run of Junebugs, which moved in squirmy unity, like parts of somebody’s face.” In “I Knew Gable Roy Henry,” A boy in music class kneels “with strange devotion to work [his] thumbnail into the clay-red floor,” hoping he might “complete ‘Boyner’ before ‘Thomas’ had faded away.” These details not only create the world of the story, but they also remind us how important it is to slow down in the story. Garson’s characters are down on their luck odd jobbers, teenagers figuring it out, middle aged men, and all stuck in the past. No matter the character or narrator, the writing is hidden. Garson lives in his worlds and so we are inside in them too. No one is telling us a story, even if his characters are doing just that. And many are, men we picture scruffed and missing a former shine, lost in some legend of their past. Usually, they are not the legend; instead, they remember the Goth baseball player or the country singer posing as an elementary school choir assistant and try their damnedest to piece their story, their part in the story, together. His narrators are self conscious about getting it right. We get the sense this is not the first time they’ve told this story, and that they’ll be telling it for the rest of their lives. The majority of the stories in the collection are flash. The pieces are sometimes jokes, sometimes gut punchers, and always what I like to think of as long form haikus. When you’re taught a haiku in middle school English, you only learn about the syllables. What you don’t learn about is the twist. Haikus are about constraints, and certainly Garson does wonders with his word count, but within that constraint, the last line needs to be a surprise, a twist that changes the poem from a description of a flower to something larger. This is exactly what Garson offers us with his shorts. They start off as a funny or strange or vivid vignette, but they take a turn and the end leaves us seeing why this small story is being shared. Purchase Is That You, John Wayne? HERE.